A steel structure immersed in seawater is protected from corrosion through 40 sacrificial anodes. This example models the potential distribution at the surface of the protected structure assuming a constant limiting current for oxygen reduction at the protected surface. Corrosion costs the world upwards of $1 trillion each year. Most corrosion occurs due to electrochemical reaction processes taking place underwater and in wet or humid environments. The Corrosion Module allows engineers and scientists to investigate these processes, gain an understanding of the extent to which corrosion could occur over the lifetime of a structure, and implement preventative measures to inhibit electrochemical corrosion, in order to protect their structures. The module can be used to simulate corrosion at the microscale in order to investigate the fundamental mechanisms, and at larger scales to determine how to protect massive or long-ranging structures from corroding. 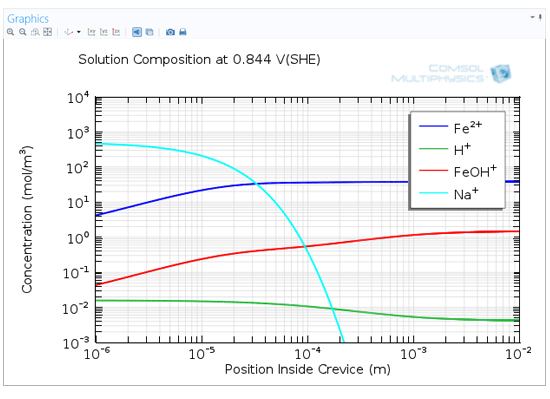 The Corrosion Module includes features, interfaces, and example models that enable a straightforward approach to the simulation of all electrochemical corrosion processes, such as galvanic, pitting, and crevice corrosion. Transport in corrosive and corroded material is accounted for through the dynamic modeling of changes in the corroding surface and the electrolyte in contact with such surface. The Corrosion Module includes standard interfaces for modeling the corrosion potential and current distributions of corrosion processes where the electrochemical reaction kinetics can be described by the Tafel, Butler-Volmer, or other user-defined equations. The electrochemical reactions are fully resolved together with electric potentials in electrolytes and metal structures, homogeneous chemical reactions, and phenomena unique to corrosion processes such as the change of the shape of a metal surface due to corrosion. Iron concentration and contours of the electrolyte potential in the tertiary current distribution study of the galvanic corrosion of a galvanized nail. The Corrosion Module also allows you to design effective corrosion protection systems. 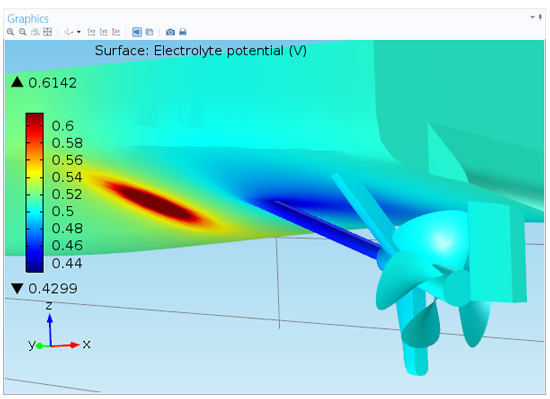 This includes the simulation of Impressed Cathodic Current Protection (ICCP), sacrificial anodes, and anodic protection, where anodic current is impressed on corroding material to enforce passivation. By using the Corrosion Module to investigate the specific protection mechanisms at the microscale, you can extract parameters that may be used to simulate larger structure, for example hydroxide film growth on protected structures. You can import CAD files containing your designs in COMSOL Multiphysics, and then set up the description of the protection process. Upon identifying regions in your structure that are susceptible to accelerated corrosion, you can specify the placement of sacrificial anodes, and where cathodic or anodic protection currents should be impressed. Another application of the module is to estimate the effect of stray currents on the corrosion of buried structures or structures under water. You can then also use the module to optimize the positioning of protective electrodes to avoid this corrosion mechanism. When correctly designed, these electrodes mediate the uptake of stray currents without corroding the structure placed close to a stray current source, e.g. a railroad. The impact corrosion can have on a structure over time can be downright catastrophic. As corrosion removes material from a structure, it may compromise its structural integrity. In some cases, you may want to do a structural analysis in combination with corrosion analysis to see which parts of the structure are subjected to high stresses and strains. Corrosion in these parts may be devastating, so you want to make sure that these parts are protected. To understand the corrosion effects and to optimize your corrosion protection design, you can combine the Corrosion Module with the Structural Mechanics Module. 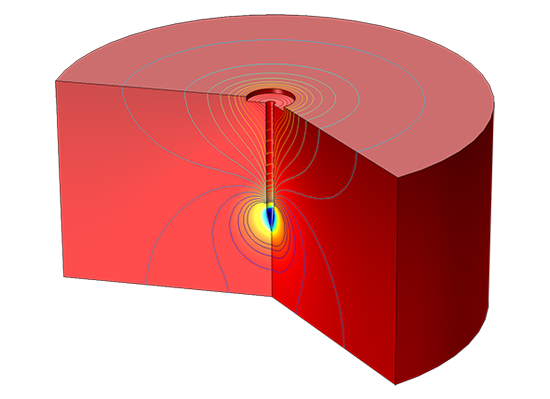 This is thanks to the extensive power of COMSOL Multiphysics, which allows you to directly couple models built in one module with any other module. In other cases, turbulent and multiphase flow may need to be combined with transport of chemical species. You can then use the CFD Module in combination with the mass transport interfaces in the Corrosion Module to obtain accurate mass transport descriptions. Impressed current cathodic protection is a commonly employed strategy to mitigate the ship hull corrosion where an external current is applied to the hull surface, polarizing it to a lower potential. In this model, the effect of propeller coating on the current demand is demonstrated.